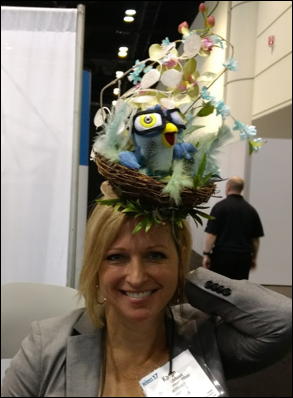 Monday at HIMSS was a blur of activity – it’s a good thing I make notes as I go. 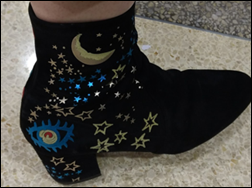 Due to traffic and parking issues, I didn’t quite make it to the keynote, but all was not lost since it put me in the right place at the right time to spot these Valentino boots. As the hall opened, I spotted Judy Faulkner in the Epic booth doing what looked like a final walk-through. The HIStalk crew hit the floor handing out sponsor signs. I spotted the team at Orchestrate Healthcare admiring theirs. Healthfinch also had their sign prominently on display, right next to the fascinator hat created by Karen Hitchcock to wear to HIStalkapalooza. The morning’s booth crawl revealed several vendors with people in white coats – will they never learn? One group of booth attendants looked like they were ready to work the Clinique counter at Nordstrom as opposed to telling us about hot new healthcare technology. I met up with HIStalk reader Evan Frankel and we stopped by the Hyland OnBase booth to see their magician, who continues to impress. After the usual card tricks and coin tricks, he did one with books and having the audience pick words from the pages, that left me speechless. It was probably in the top 10 of magic tricks I have seen. Several vendors have downsized their booths (or at least it feels that way), including Greenway and Athenahealth. Hopefully they’re spending more dollars on research and development instead because the industry certainly needs it. The industry might also want to take a cue from the AMIA meeting and offer HIMSS-related childcare. We came around a corner and saw a young boy sitting curled up under the counter of the Meehealth booth. Even more unnerving than that was the hospital beds with patients in them at Masimo and the woman on the table at Novarad. It might be good for building your performance art or modeling resume, but it just seems weird. I had a nice chat with the gentlemen at Ascent Testing Group, which hails from Fort Worth. They offer assistance to physicians in brokering genetic testing and provide easily interpreted reports. They were also engaging, easy to talk to, and a great example of what booth staff should be. We also passed the HP Enterprise booth (1979) with its charity cash grab chamber, but I wasn’t lured into being blasted with swirling money, even for charity. 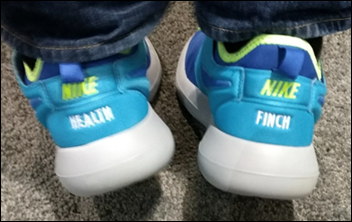 As the day wore on, I was wishing I had a pair of these nifty shoes spotted in the healthfinch booth because my feet were getting tired. 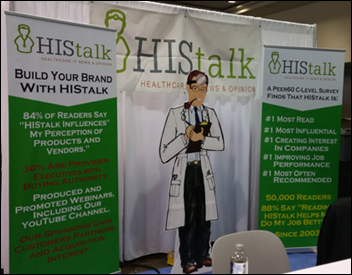 The HIStalk booth is amazingly located this year. I had a chance to stop by to chat with former Surgeon General Regina Benjamin, MD. I ran into lots of people I knew in the hall, including informaticist extraordinaire Bill Hersh, but missed some old friends that have moved on from the industry. The happy hour at Orion Health featured New Zealand wines, which gave us a boost to head back to get ready for HIStalkapalooza. The party had a bit of a slow start due to traffic, but once Party on the Moon hit the stage, things picked up. It’s always great seeing readers having a good time and catching up with the people who keep me sane in this topsy-turvy industry. Of course, no HIStalkapalooza would be complete without my annual Matthew Holt dance party. As things wound down I headed out to get some much-needed rest.